Success in our personal financial life is something we all desire. What that financial success looks like is different for each situation. However, there is one undeniable truth that applies to all of us when thinking about how to achieve our financial dreams and goals – investing money will help you get there. There are several challenges though when it comes to investing money. For one, people scare themselves out of investing money for fear of losing it. They see the ups and downs of the stock market and don’t want to be involved with that volatility. Others may not know how to invest or where to start. I remember learning about investing money in my early twenties and feeling extremely overwhelmed. Still others may feel they lack the time to really make investing work for them. They either started to late in life to make a difference or just don’t have time in their daily schedule to learn about it. And finally, perhaps the biggest challenge of all – some just don’t have the money to invest. When should I start investing money? Where (in what) should I be investing money? Who can help me invest? Which risks or common mistakes should I be aware of? In other words, investing money is about putting cash into something in order to make money. That’s the end goal – making more money. When we place money into an investment, we are anticipating that the amount we originally put in (our principle) grows to be substantially more. By definition, we really aren’t investing if we don’t expect our money to grow even just a little. In essence, our investment buys us a piece of whatever entity into which we place our money. The more money we put in, the bigger the piece we own. The more money we put in the bigger our potential return (or loss) could become. So if I owned a business, I could let you buy into that business with some of your personal money. If my business did well, the overall value of the company would grow. You, as a part owner, would see the value of your share of the company grow as well. If in time, you wanted to cash out your portion of the business, you could sell it back to the company or to another investor and receive the increased value of your principle (your profits). You would have then exited the investment with more money than what you originally put into it. That’s an investing success. Why Should I Be Investing Money? One thing you know instinctively about investing money – it does involve risk. If the business in the example above did poorly, then an investor could lose money. In fact, if the business failed and went bankrupt, an investor could lose all their money. So, if that is the case, why should we invest? Why take risks that are that high? Wouldn’t it be better to keep our money locked in a fire safe behind the clothes in our closet? Or, at the least, put our money in a savings account that is insured by the federal government. Related Content: What is a Savings Account and Does My Child Need One? This is really the first barrier every investor has to confront. All of our financial situations and risk tolerances are different. For now, I would say that if you feel the investment risk is too great for your situation, then you shouldn’t invest. I will get back to this point in more detail later in the article. There are, however, several very legitimate reasons why we should invest. The first is simply the desire to build wealth. If I put $1,000 in a cookie jar and leave it there for 10 years, I will still have $1,000. The money has done nothing but sit there. I haven’t lost any but it hasn’t grown and contributed to an increase in my net worth. But you might be thinking, “Yeh, but I still have my $1,000 to buy stuff.” That thought leads me to the second reason investing money is important – inflation. In economics, inflation refers to the general increase of prices on goods and services over time. What a gallon of milk cost in 1970 is not the same as today. Generally, inflation creeps up slowly each year so that a consumer may not notice a huge difference. But when we compare 10 or 20-year periods of time, you would easily see a noticeable shift upward in prices. Therefore, the $1,000 you had stuffed in a cookie jar does not purchase the same amount of goods and services that it did 10 years ago. Prices have gone up so your $1,000 does not go as far. The third reason to take the risk is that the odds are in our favor as investors to make money. This is especially true when we look at investing in the U.S. stock markets. A long term look at the S&P 500 (an average that gauges the performance of the 500 biggest and most stable companies in the New York Stock Exchange) show us that. Do a Google search and you will find that most financial computations place the S&P 500 average annualized return to be around 10% since it’s inception in 1926. In that time, there have been big up years, bid down years and slow, plodding, just-break-even years. All in all though, the market averages out to be a very decent return on one’s money. Even if you feel that number is a couple of percentage points too high, I would still take an 8% annual return on my money in the financial markets than the less than 1% return I could get on my money in a savings account at the local bank. Here is an example to drive this point home. Take your $1,000 cookie jar money and invest it for 10 years at the 10% historical average of the stock market. In 10 years, our $1,000 would have grown to $2,707. And if I also invest $1,000 more each year for those ten years, I’ll have close to $20,000 by the end of the time period. That’s how investing regularly helps grow our money. And above all, it’s why it’s worth taking on the risk. You may be asking, “How do I know if I’m ready to invest? When should I start?” These are great questions that have some not so clear answers. In my perspective, deciding whether or not to invest is sort of like deciding to become a parent – we are never quite sure we are ready. The best a would-be parent can do is prepare as much in advance for what lies ahead. My wife and I read a ton before the birth of our first child. We took the breathing classes and went through all the medical tests. We talked to other parents. But even with all that, at some level we still felt inadequate. The only way to truly understand what it’s like to be a parent is to become one. It’s the same with investing money. You won’t know everything at the beginning. That’s OK. The best you can do is read to gain a basic knowledge of the investing process. You can talk to people who have had success. You might even track the progress of some different investments for six months. Then, when you get the basics and decide you are ready, pull the trigger and begin. There is no magic age or time to begin investing. A 17-year old can learn how to do this and begin investing before they graduate from high school. I wish I had. That being said there are three differing opinions in the investing world as to when you should start the investing money. Visit any finance site that tracks the daily fluctuations of the stock markets and you will run across a chart or two that shows the historical performance of the three major averages – the Dow Jones Industrial Average, the S&P 500 and the NASDAQ. Click on these charts and you will see the up and down movements of the major averages for any time period you select. The 5-yr. chart of the S&P 500 below is a little dated. However, it provides some clear examples for my discussion here. As you can see, there are valleys and there are peaks. The basis of position #1 is that an investor should wait for a lowering of stock prices and use that time to invest. It seems to be a logical approach, to only buy at a lower price level. #1 – Emotions run high when the market is in a downtrend. Fear can be rampant. Even seasoned investors give in to fear and go completely against their investing philosophy. How much more so would a beginning investor do that. Will you buy stocks when it seems like everyone else is selling their positions? #2 – We cannot predict future trends in the market. As you can see, there was a tremendous buying opportunity in late 2008 and early 2009 when the economy was going through an economic meltdown. 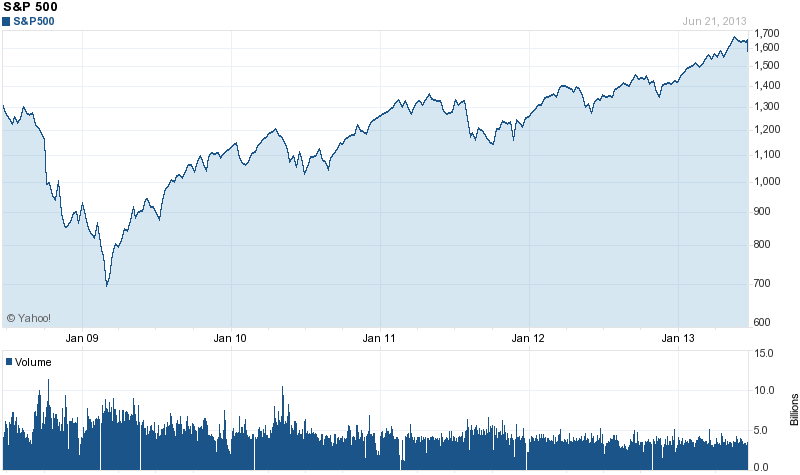 Then the market went generally up with smaller pullbacks in the middle of 2010, 2011 and 2012. Anyone who invested in the S&P at any point during the low of 2009 and held their position to 2013 made money. Those who waited for another big pullback like the one in 2008-09 never saw it and missed out on a huge return in stocks. This idea is rooted in the belief that time is the most critical element in the investing equation. It doesn’t matter if you are a high school student making minimum wage at a summer job or are married with large amounts of consumer debt. You must start now. The earlier you begin investing money, even in small amounts, the more you can maximize big returns in the long run. “Person A” begins investing at age 19. She contributes $150 per month ($1,800 per year) for 8 years, until the age of 26. The total amount of money invested equals $14,400. If she were to average 12% return per year, by age 65 that investment would have grown to $2,264,026. Keep in mind that is without investing another dollar after the age of 26. “Person B” begins investing at age 27. He contributes $150 per month ($1,800 per year) for 39 years, until the age of 65. The total amount of money invested equals $70,200. 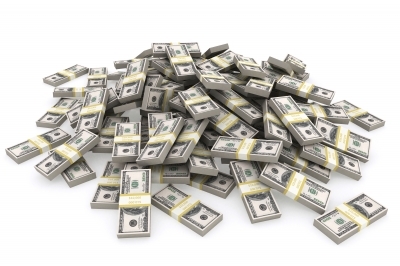 If he were to average the same 12% return, by age 65 he would only have amassed $1,580,051. Person B invested $55,800 more actual dollars over the investment period yet fell $683,975 short of the mark achieved by Person A. What does this idea mean exactly? It means that you won’t start investing money until you have reached a few other financial goals. But what goals could be more important than investing money? For starters getting rid of all non-mortgage debt (i.e. credit card debt, school loans, car payments, etc.). Secondly, you would establish a healthy savings account and use it to handle life emergencies. Only after you reach these financial milestones should you begin investing money. This position is controversial because of the time issue. If a person waits X number of years to pay off debt and save, they would miss out on critical time periods where investments could be growing. Indeed, as I’ve already pointed out, a person not invested for the last 4 years would have missed out on very nice returns. All that is true. However, I believe the psychological benefits to position #3 are routinely discounted. It is an incredible achievement to have all non-mortgage debt paid off and to have accumulated a fully funded emergency fund of 3-6 months of expenses. Reaching those milestones brings peace of mind and allows for freedom of choice again. In addition, it frees up larger amounts of money to be moved toward investments. I think it is unwise to dismiss this position as foolish and invalid. Some people do need to clean up their financial mess before investing money. That’s actually a wise financial move. In the long run, it may prove more beneficial in ways not calculated in investment dollars alone. So what’s going to work out best for you? Of course, it is a personal decision that only you can make. My conclusion is that the practice of timing the stock market as a means to begin investing money should be discouraged. Positions 2 and 3 are both valid approaches. Of those, I’d lean towards position 3 – getting your mess cleaned up first. The stock market will be there when you are ready. And getting out of debt and saving money are never bad financial moves. Over time, I’ve learned investing money doesn’t have to be complex. In fact, i believe the best principle is to keep it simple. The simplest strategies are often times the most rewarding and the most calming on your nerves. So as a blanket statement follow this advice – Always invest in things you understand and could explain to someone else. Now, before I show you places to put your investing money, I need to say a few things about risk. It’s risk and the thought of losing money that keeps people up at night. I’ve been there as an investor and it’s no fun. You can reduce the anxiety that comes with investing money by understanding beforehand what level of risk you are willing to take. In the investing world, this is called analyzing one’s risk tolerance. I can’t stress this point enough – you must think through your personal circumstances and mentally calculate how much risk you are willing to handle. One factor that can help you determine how much risk to take is how long it will be before the money you invest will be needed. For example, if money is going to be needed in less than a year, you definitely want to take on something very conservative. In fact, you could say that a person with this short a time horizon should not be investing in the stock market at all. If the money is going to be needed in five years, a person can afford to take a little more risk. If the money invested won’t be needed until retirement – 30 or 40 years down the road – a person can take on much greater risk. They have time to ride out market ups and downs. They can endure a down period in the market because their time horizon is so far down the road. Another factor that helps us lower investing risk is a concept known as diversification. Simply put diversification means to spread around. It’s the old adage “don’t put all your eggs in one basket.” If you put all your eggs (money) in one basket (investment) and that basket gets toppled over (fails), all your eggs will be scrambled (lost). However, you could spread out your money into multiple investments. This way, if one of the investments doesn’t perform well, it doesn’t affect the rest of the investments as much. You won’t lose all your money in the process. 1. A CD (Certificate of Deposit). CDs are a savings instrument, usually found at your local bank, that offers a higher interest rate than a normal savings account. They can offer this because when a CD is purchased, the individual is committing to have that money locked up for a set amount of time (3 months, 6 months, 1 year, etc). Usually the longer the time period of the CD, the higher is the interest rate. CDs are a type of low risk investments. Therefore, the return will be minimal. And keep in mind, the money invested in a CD is not liquid (or immediately available) because of the time commitment. Related Content: Are CDs a Good Investment for the Average Joe? 2. Single Stocks. If I owned a business, I could let you buy into that business with some of your personal money. In essence, you would become an owner by purchasing a small piece of my company. Your return on your investment comes as my company increases in value and the value of each share goes up. You would also see a return on your investment if my company decided to pay a dividend (a cash payout) to the individual shareholders. Single stocks investments have a high degree of risk. Remember, a high degree of risk means the higher potential reward. It also means a higher degree of failure. When you invest in a single stock, you are placing your eggs in one basket. You are trusting that this company will continue to grow and increase in value without missteps or internal criminal behavior. There is nothing wrong with single stock investing per se. However, I would argue this is not the best place for the beginning investor. You may use it later once you have grown some assets to help diversify your portfolio. 3. Bonds. Sometimes referred to as fixed income assets, bonds are a debt investment whereby a company, a municipality (a city) or the government agrees to owe you money. Think of it as an I.O.U. The investor lends the issuer a set amount of money and the issuer agrees to make regular interest payments on the bond over a set amount of time (1-yr., 5-yr., 10-yr., etc.). The end of that time period is known as the maturity date. When the bond reaches its maturity date, the issuer agrees to redeem the face value (the original investment amount) of the bond. The income derived from a bond is predetermined and set for the length of the bond period. The actual value of the bond may fluctuate, much like the price for a single stock. In this way, bonds provide the investor with a regular source of income, assuming the issuer does not default (failure to pay) on the bond. 3. Mutual Funds. In a mutual fund, investors pool their money together by placing it in the hands of an investment company. This company then invests the money in a fund designed to meet certain investing objectives. The investment company hires a portfolio manager to actively manage the operations of the fund. An investor’s return comes as the value of the fund increases over time. Some mutual funds are designed to generate income while others focus on investing in growth companies. There are index funds (like those available at Vanguard), that track the performance of a market index, like the S&P 500. Some funds invest only in international stocks. Still others track the performance of a particular sector of the market like energy, healthcare or technology. One can even find mutual funds that invest in commodities like oil or gold. Mutual funds are great long-term investments that offer instant diversification. They allow an individual with small amounts of money to allocate their investment dollars in an easier way than they could have done on their own. 5. Real Estate. There are two basic types of real estate investing – investing in your own home and investing in rental properties. Purchasing your own home is still an excellent investment choice assuming you are financially ready. Investing money in rental real estate can also add to a well-established portfolio. But rental properties require a great amount of cash to purchase and maintain. Therefore, it would be prudent to grow some wealth first to have the needed capital to back up such a venture. Real estate is the least liquid investment I have mentioned. Once invested, it is very difficult to get your money back quickly because it is dependent on selling the house. Don’t put money here that will be needed in the short-term. I know some circumstances demand more risk than I want to accept. In those instances, I’m way out of my comfort zone. I would much prefer life grant me slow, boring, predictable moments that are within the scope of my abilities and emotions to handle. That’s my personality. And it’s why I love mutual funds. A little earlier I introduced the term “diversification.” Diversification means to spread your money around. By placing money in different investments, you protect the whole should one of our investments falter. Diversification is the #1 reason mutual funds are the best place for the investors. This is so because even by only owning one fund, you get instant diversification. Here’s how. What Really Is a Mutual Fund? A mutual fund is a collection of different stocks all rolled up into one instrument. By purchasing the fund, investors pool their collective money and get exposure to all the stocks in the fund. Some funds are smaller with 30-50 stocks while others have hundreds, even thousands. For example, Vanguard’s flagship fund is the Vanguard 500 Index Fund. It’s been around since 1976 and is designed to mirror the performance of the S&P 500. Because it wants to move in lock step with the S&P 500, it must proportionally invest in the 500 companies that are in the index. These companies represent the largest U.S. companies, spanning many different industries. A look at the top ten holdings of this fund as of this writing would reveal some very familiar names (listed in order from #1-10): Apple, Google (Alphabet), Microsoft, Facebook, Amazon, Berkshire Hathaway, Johnson & Johnson, Exxon Mobil, JPMorgan Chase and Bank of America. These are the titans, the big boys of industry. They represent around 20% of this fund’s $350 billion in total net assets. The other 490 companies in the fund make up the remaining 80% of the fund assets in varying proportions per company. So if Google begins to outpace Apple in the smartphone war, their stock will most likely rise while Apple’s stock will fall. This would be a problem if an investor were ONLY invested in Apple. Their portfolio would suffer, perhaps quickly. But by investing in the fund, Google’s rise counteracts Apple’s fall and the result is a wash for the investor. There would probably be little change in the value of the fund based on this basic scenario alone. That’s how mutual funds help reduce risk. If one stock fails the whole fund doesn’t fail. You may feel the urge to get started with this process quickly but there is no need to rush into a purchase. There are a few things to consider before you even start looking at funds. If you do these three things, your investing life will have a much greater chance of success. 1. Apply your risk tolerance to selecting funds. Here is where our discussion about risk tolerance comes into play. Every mutual fund has a risk scale from low to high. For example, Vanguard lists their 500 Index Fund as a 4 on a 1-5 risk scale, with 5 being highest risk. It’s riskier because this fund has full exposure to the U.S. stock market. In other words, it is an all-stock fund that will go up and down as the market goes up and down. So for starters, you will want to match a fund’s risk tolerance with your own level of risk tolerance. And as you buy more funds over time, you will want to diversify even your risk tolerance. You don’t want all risky funds or all safe funds. A good diversification of funds would include some of each. 2. Identify investing goals. Mutual funds have different goals. Some produce income for investors. Others strive for growth. Still others help people save money for college or retirement. So the question to answer here is, “What am I trying to accomplish with my investing dollars? What do I need?” Once you know that, find a fund to help you reach those goals. 3. Determine your asset allocation. In other words, develop a plan to spread your money around to get maximum exposure to as many stocks as possible. The Vanguard 500 invests in the 500 largest companies in the U.S. It’s a great place to start. You get the large company capitalization exposure one needs in a portfolio. (Capitalization refers to a company’s size.) Some companies aren’t that big and are called mid-cap or small-cap. They are growing, sometimes aggressively. An investor needs some of these smaller, aggressively growing companies in their portfolio as well. Still other companies aren’t in the U.S. They are investing markets like Europe, South America and Japan. You will find these companies in an international stock mutual fund. An investor will eventually want exposure here too because sometimes the world markets perform better than the U.S. market. The percentages are just an example but they are a good place to start. Figuring out the percentages, or whether or not to include some fixed income (or bond) funds in your portfolio will be your call. 1. Evaluate fees and charges. It costs money to hire the personnel to manage these funds and they pass that expense on to investors. You need to look for expense ratios at less than 1%. The higher the expenses, the more those expenses will eat into returns. (As a point of reference, the Vanguard 500’s expense ratio is .17%. That’s very low. It’s low because they don’t have to do much to manage the fund. It’s designed to track the S&P 500 index.). Some funds even charge commissions on trades. In the mutual fund world, these are known as “loads.” Look for that terminology and avoid funds where the commissions are excessive. 2. Look at turnover. Turnover rate refers to the percentage of a fund’s holdings that have been replaced (turned over) with others during the course of the year. In general, lower turnover is best. 3. Review past performance. All funds show how they have performed over various time intervals. Look for funds that have been in existence at least five years, the longer the better. Evaluating past performance is important. However, past performance is not a guarantee (or a predictor) of future results. One cannot say with certainty that a fund will continue to perform like it has. We do not know how future world and economic events may affect that fund. Past performance is an indicator only. However, it is the best indicator we have. Funds like the Vanguard 500 that show a 11.00% average annual return since its inception in 1976 are a good bet to continue that performance. As of 2017, that’s a 41-year fund history of investing through good times and bad. 4. Be aware of minimum investment requirements. Some funds allow an investor to begin with as little as $50. Others, like the Vanguard 500 require a much higher initial investment ($3,000). 5. Look at independent third-party evaluators. Sites like Morningstar and Standard and Poor’s offer valuable rating services on all funds. See how these sites rate prospective funds before investing. Learn as much as possible about the funds. Know exactly what you are getting into and why. Remember, if you can’t explain the investment to someone else, then you probably should not be investing in it. Setting up a trading account is the final step in the process and it’s pretty simple. This can be done through a discount brokerage firm like Scottrade or Etrade. Or you can choose to go through other investing companies like Vanguard, Fidelity or Charles Schwab. Again, it’s a personal preference here – research them all. There will be paperwork (either online or mailed) that needs to be filled out and, of course, money deposited in the account (by mail or wire transfer from your bank). Wait until you receive a positive account confirmation status from the company before you send any money, unless they say otherwise. When it’s time to purchase your shares of the fund, look at the fund’s NAV or net asset value. The NAV is the mutual funds price per share. They calculate the price once each day based on the closing prices of all the stocks in the fund. Base your trade on how many shares your cash will buy. If you know how to choose a mutual fund you realize they are the low-maintenance, diversified, sleep-well-at-night investing machines. They serve as the cornerstone of your portfolio. For my money, it’s where every investor should start. Investing money doesn’t have to be complicated. However, we make it so by doing some very silly things. In the end, our constant meddling brings nothing but frustration and lower returns. I’ve already touched on a few of the most common mistakes like failing to evaluate your risk tolerance and failing to have a plan. But I’ve noticed through the years that other, less obvious issues keep me from having success. Here are few issues to look out for. Stock market action can be volatile. At 10:00 AM on any given morning the market could be up 150 points and by the end of trading at 4:00 PM be down 200 points. People get excited if you string a series of positive days together. However, if prices turn negative for a prolonged time, people get discouraged. Fear and greed can drive stock market action. Greed works because people want to make money. Fear works because people don’t want to lose money. The two emotions are so powerful the blind us from making wise decisions. When you trade out of greed or fear, you aren’t thinking rationally. You just want out (fear) or in (greed) depending on the market conditions. For beginning and seasoned investors, emotions are powerful. Making investing decisions based on your feelings is dangerous. Learn to control them as much as possible. There are two sides to this issue. You could be someone that invests in a stock or a mutual fund and then doesn’t look at it for years. You have no idea what’s going on in the fund, what kind of company events are affecting the stock or how the market action is driving the price of your investment. It sounds amusing that someone would take this approach but it does happen. On the other hand, you could be an investor who obsesses over each up and down stock tick every day the market is open. You have the financial news channel on all day long. There is a streaming stock ticker open on your computer so you can make a quick trade over lunch. You base decisions on what’s happening in the moment. To be a successful investor, you must maintain a balance of monitoring. I definitely don’t neglect my investments. But I don’t obsess over them either. I am generally aware of what is going on in the market from day-to-day only because I’m reading news online. But I don’t check my portfolio each day to see my gains or losses. And I don’t calculate my net worth every week. You’ll need to find a place in-between neglect and obsession that allows you to stay aware but also have a life. It takes time to make a lot of money with your investments. I would rather have it happen fast. Would you rather be given a million dollars next week or 10 years from now? My hand is up for next week. Because we’d rather have the money now, we take unnecessary risks. Sometimes we even fall for ridiculous get-rich-quick schemes. Then the risk we took becomes a nightmare when our money disappears as the investment comes crashing down to earth. Remember, consistent, focused discipline over many years is the more tried and true method of producing wealth. Everyone has an opinion about investing money. It’s OK to listen and process these opinions. However, in the end the only one that really matters is your own because you set the investing agenda for your life. Hold true to your investment philosophy. Only adjust it after great study and evaluation. And remember, the financial media exists to create ratings for their respective networks. There agenda is to get you to watch. So they will make EVERY market event seem like it’s the most important one. Keep this in the back of your mind the next time they say the sky is falling. It’s most likely not. Related Content: What Does a Financial Adviser Do and Do I Need One? I mentioned earlier that the most basic rule for investing is to keep it simple. For most of us, investments in mutual funds, individual stocks, and bonds will do. However, there are other investments that could bring further diversification such as investing in gold and other commodities, purchasing land or buying rental properties. Just keep in mind that you don’t have to put money into every area possible. You can achieve an appropriate level of diversification by just investing in mutual funds. With mutual funds though, you need to avoid creating too much overlap by investing in funds that basically hold the same stocks. For example, all the stocks in the Vanguard 500 Index Fund are also in the Vanguard Total Stock Market Index Fund. Many of the same are also in the Vanguard Large Cap Growth and Income Fund. They are not in the same proportions in each fund. However, holding all three of these in a portfolio would create significant overlap. So be aware of the basket of stocks that make up a mutual fund by reading the funds prospectus before investing. If you’ve read this far, congratulations. You must really want to start investing money because this has been a lot of content. Feed off that enthusiasm and begin the next steps. Just keep in mind, the next steps may not be to invest right away. You may need to get out of debt first or build up that emergency fun first. It’s completely fine if that is the case. As I said earlier, those two things should be in place before you start investing, especially the get out of debt part. My article How to Get Out of Debt and Win in Five Simple Steps can help you with that. If you’ve already reached those two financial goals, congratulations. You are ready to start investing for the future. Follow the steps I outlined and you will be on your way to reaching your financial goals. If you have any further questions about investing money, feel free to ask in the comments below or contact me here. Questions for Discussion: When did you start investing money? Do you wish you had taken a different approach? Did your parents teach you about investing or did you learn on your own? What’s the worst investing mistake you’ve made? Do the ups and downs of the market sway your emotions?